Suwanee is a city where the old and new coexist in perfect harmony. Named one of the Top 10 Best Places to Live in 2007 by Money magazine, Suwanee is known for its progressive mindset, while at the same time preserving its history and stewarding its local woods, wetlands and animal habitats. In this quaint town, you’ll discover historic homes and buildings from the 1870s standing beside locally-owned specialty boutiques and excellent restaurants on Main Street, miles of trails, and lots of special community events for entertaining the entire family. Far more people own their homes over renting them in Suwanee. In fact, over three-fourths (76 percent) of people are homeowners. The median home value in this city is $273,100, compared to an average of $184,700 nationally. Rent is also higher in Suwanee with a median rent of $1,443; by comparison, the national median rent is $949. The most popular home styles here are the contemporary, ranch, Victorian, and farmhouse. Suwanee isn’t served by the Atlanta Metro Area’s public transportation system, so nearly all the commuting happens by way of car. This is made easier because there are three major roadways that run through Suwanee, including Interstate 85, State Route 317, and U.S. Route 23. Suwanee is home to the first Bike Share program in Gwinnett County and the city’s growing trail system will soon have six different trails connecting community neighborhoods to schools and businesses in the area. Suwanee has a female-majority at a rate of 53 percent to 47 percent, and over half of the adults (51 percent) have earned a bachelor’s degree or higher. This is a racially-diverse community comprised mainly of whites (59 percent), Asians (19 percent), and African-Americans (14 percent). Hispanics and people of two or more races are also growing in numbers in Suwanee, further diversifying the area. Suwanee is equally-divided among the different age groups, with the largest group being adults aged 35 to 44, at 17 percent. Children aged 10 to 17 and adults aged 45 to 54 are tied for second at 15 percent each, and seniors 65 and older make up 10 percent of the population. In Suwanee, the median individual income is $40,727, considerably higher than the national median of $27,419. The median household income is also higher than the national average at $85,306 in Suwanee compared to $55,322 nationally. The unemployment rate in Suwanee is just two percent, nearly half the national rate of 3.8 percent. From affordable eats to fine dining, the choice is yours when you live in Suwanee. The city enjoys a bounty of excellent restaurants despite being a smaller suburb of Atlanta. Some of the favorite eating establishments among the locals include MoRi House Sushi & Grill, Ippolito’s, and Greek Island Grill & Bar. There’s also Taqueria Los Hermanos for authentic Mexican food, Umaido for the area’s best ramen, and the Jamaican food specialties at Country Pepper. For cheap eats, you can’t go wrong with lunch at Brown Bag Deli and Café. You’ll also find pizza is one of the most popular foods in Suwanee and there are plenty of places where you can get a slice, like Grandma’s NY Pizza, Sid’s Pizza, Your Pie and many others. Looking for a cool nightspot where you can unwind after work or on weekend evenings? Check out Sip Happens, Suwanee’s boutique wine bar. Or, if you want to enjoy some hookah, then you’ll want to go to Vice Bar & Bistro or Bliss Bar And Lounge in Johns Creek. Pub Ten is where you’ll find great drinks and tasty pub fare, while at Twisted Tavern in nearby Buford, you might come for the brews but you’ll stay for the incredible wings. Suwanee embraces the arts and it shows with the many pieces of public art on display throughout the city via the Public Arts Commission. The Suwanee SculpTour showcases a constantly rotating selection of sculptures with one sculpture purchased each year to add to the city’s permanent public art collection. Suwanee also has an Art on a Limb program where two pieces of original art are hidden along the Suwanee Creek Greenway or at one of the parks every day through the month of May. The person who finds the art then gets to keep it. 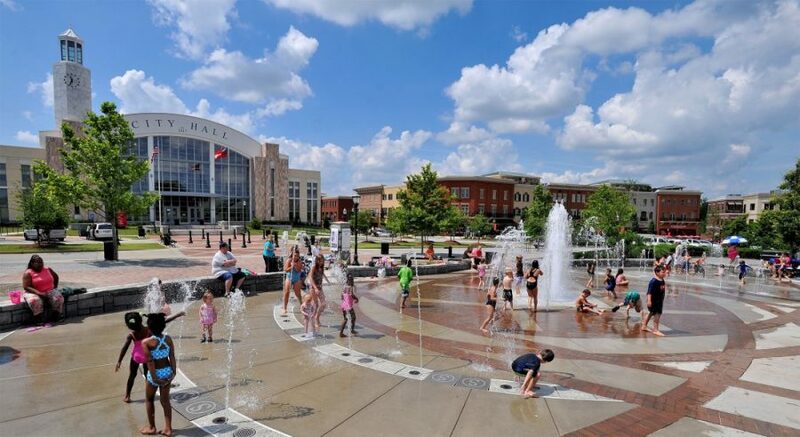 Suwanee has plenty of points of interest for those new to the area as well as long-time residents, including the Aurora Theatre, Everett’s Music Barn, Suwanee Town Center Park and more. Plus, you can root on the local minor league teams, the Gwinnett Stripers and Gwinnett Gladiators, or head into Atlanta for Falcons, Braves, or Atlanta United home games. In George Pierce Park at the Prime Timers Pointe Senior Recreation Wing, seniors 55 and older can join The Good Timers, a warm and friendly group known for hosting business meetings, good meals and occasionally entertainment. Seniors can also enjoy a wide array of classes, programs, and services provided by the Gwinnett County Parks and Recreation’s senior centers. Other popular programs for seniors in Suwanee include the Gwinnett Senior Golden Games, the Gwinnett Senior Learning Center, and a host of different clubs for seniors, like the Lilburn Senior Coffee Club, the Best Friend Club and more. Suwanee also provides its community with easy access to excellent medical services, including the Gwinnett Medical Center in Lawrenceville, Gwinnett Medical Center in Duluth, Glancy Rehabilitation Center, and Emory Johns Creek Hospital. Whether you’re moving to the Atlanta area to raise a family, pursue a new career, or retire in comfort, Suwanee can provide you with the quality of life you’re looking for. Suwanee has something for everyone, from the outdoors lover to the foodie and from the lover of the arts to the sports fanatic. If you’re passionate about it, you’ll find it in Suwanee. Are you interested in Atlanta? Sign up for FREE home trends updates sent directly to your inbox!